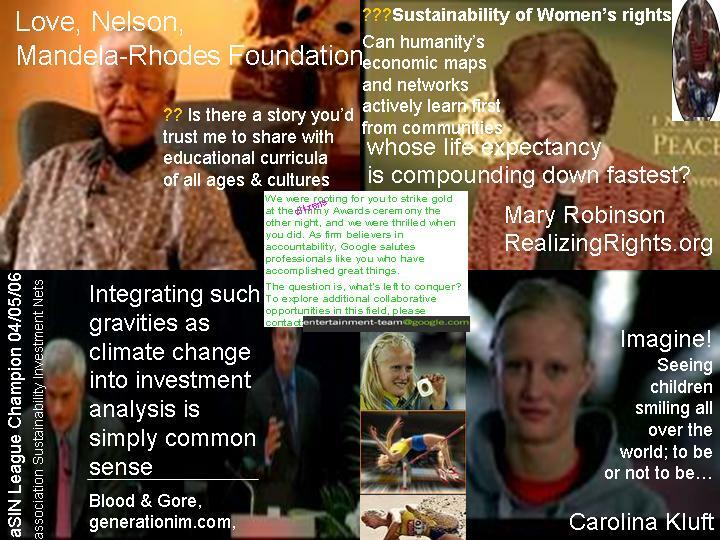 This page's 2 left hand columns indexing entries for the Good Global Guide inspired by ideas that Dr Yunus (Nobel Laureate 2006) and Grameen/Microcredit world leader of sustainability investment) is debating with 1000 citizen forums and which link to the entrepreneurial truth survey of 100 people to trust most in networking sustainability world 2007-2012. 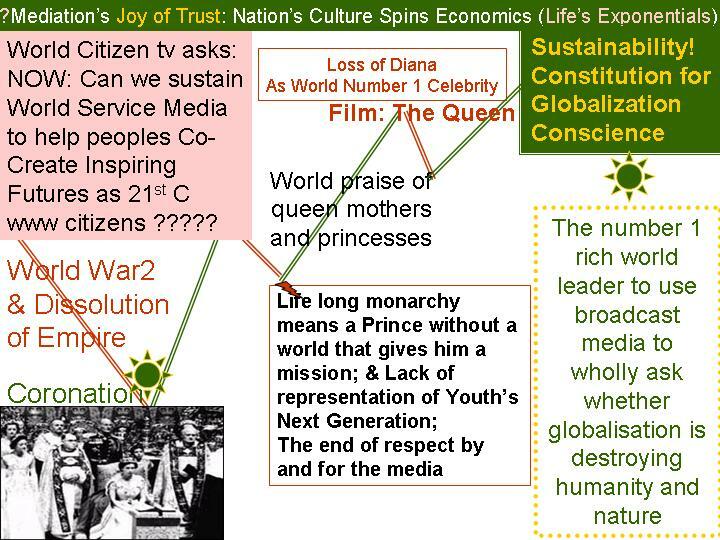 Good Global is synonomous with win-win-win global that empowers sustainable productivity of people, communities and globe - that is micro-inter-macro economc development not compounding24 years of risk since 1984 due to spreadsheeting global top-down of Orwellian nightmares and expoentials sustainability destruction of teh 1% 20% kind already modelled by Sir Nick Stern as happening in nergy and which many good global guiders believe to be compounding badwill flows and so destruction of helath andwealth through networks of professions, media, education, clean water and food, poverty, health and peace as well. In his classic essay “Politics and the English Language,” George Orwell described political speech as consisting “largely of euphemism, question-begging and sheer cloudy vagueness.” Six decades later, the tactics of disinformation and manipulation diagnosed by Orwell persist on the political battlefield, along with new propaganda techniques made possible by advances in scientific knowledge and modern technology. There You Go Again: Orwell Comes to America invites historians, linguists, cognitive experts, journalists, government officials, and political consultants to assess the current state of public discourse — and journalism’s response to it — one year before a hotly contested presidential election. The panels explore the past, present, and future of deceptive political speech, and assess what can be done to bring more realism and honesty into the conduct of America’s public affairs. What Orwell Didn’t Know; Propaganda and the New Face of American Politics, an anthology featuring twenty prominent writers and thinkers, will be released at the time of conference. "If success or failure of the planet and of human beings depended on how I am and what I do ... How would I be? What would I do?" Buckminster Fuller's prolific life of exploration, discovery, invention and teaching was driven by his intention "to make the world work for 100% of humanity, in the shortest possible time, through spontaneous cooperation without ecological offense or disadvantage of anyone". In Buckminster Fullers world, geophysic domes become the most valuable of architectures. In photosynthesis worlds, we put algae bubbles on buildings roofs so that every country becomes self-sufficient with all the green gasoline its cars and energy requires; and similar designs in agricultire maximise clean sun, water and food chains so that there is organic (non-petrochemical) food in local abundance. We hope that Nobel Peace Prize winners from 2007 on are aware of these simple ways out of climate crisis. Given this noble design objective and our vested interest as the publishing house of the inaugural worldwide guide to hubs you might expect us to feature hubs in the star ratings. Especially as supporters of Gandhians, we are well aware that 100 years of Satyagraha evolved out of weaving rural and city hubs into the peoples revolutionary and vocational education systems. The truth is the 21st C hub is far too new and diverse an experiment to be able to assign any across the board quality classification. Some city hubs are just the fashionable image of what the truth hub needs to be. Is this hub free for all its target classes in the community to use? One of London’s grandest hubs that deserves a 1* rating is the Quakers friends house. Here it is quite clear what you get. Quaker activities have their own brand . communities of practice. Rooms are let out to peace , sustainability and other goodwill networks on daily but also often serial (eg 6 times a year) club meeting bases. There is no endorsement by the quakers as a hub of any of these networks that are using the Quakers as their communal meeting space. Though of course the Quakers are extremely proud of some of the individual meets that their premise has hosted. Gandhi’s greatest ever reconciliation meeting with londoners and Europeans was helps as a thousand plus person forum in 1931. 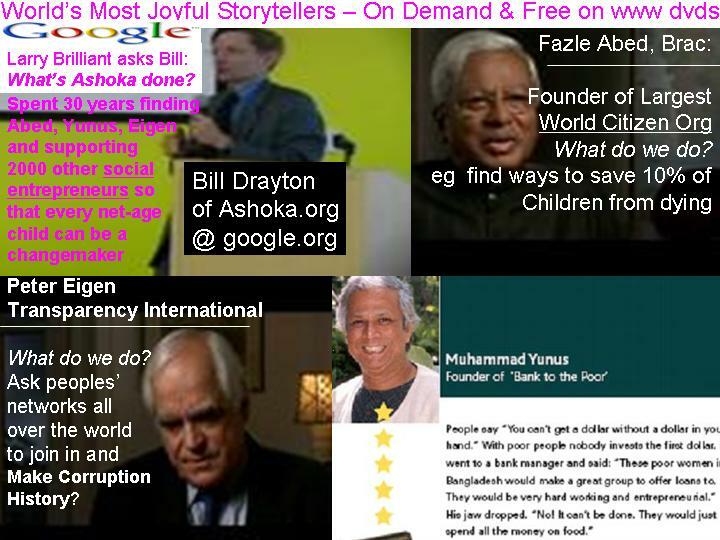 It is hoped that the Quakers Hub will host the First 1000 Yunus Forum early January 2008 -info@worldcitizen.tv subject Yunus Forum if you want latest news on our progress. Can we make a list of action learning games that world citizens may need to plug and play with the British Broadcasting Corporation’s world service charter? 1 We have the BBC's Action Networks. Over the years the BBC has connected virtual action networks with real cafes. 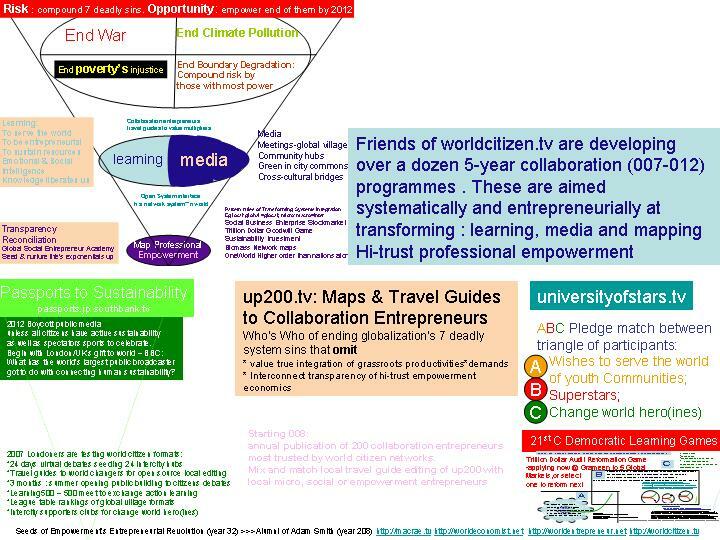 I gained experience of hosting one they co-sponsored with the RSA and Starbucks on Peoples for Pensions - if you believe that educating communities so that that there are banks that invest in each locality and long term cultural need, then I'd love to hear from you at info@worldcitizen.tv subject PFP. 2 If you believe that the world's largest broadcaster owned by the public should be raising debates on the people sustainability crises fearlessly (even if the biggest vested interests in corporations and national governments as yet have no better answers that ordinary people) then consider signing our pledge. A network of 2000 people is needed to free the chains that the governors of the BBC. Our future historian records show these shackles to true free speech were first commanded by Harold Wilson, and subsequently politicians of both parties have compounded this loss of open curiosity on sustainability of all peoples in the change world we are travelling through. To date the lowest point world service censorship has reached was when the BBC was inquiring whether weapons of mass destruction existed the worst gag censorship order in British tv history was issued by PM Blair. No wonder Her Majesty was later seen to take the unusual step to use her Christmas message to the commonwealth to ask is humanity turning on itself? Can you tell me if I put a project up does your virtual interface enable me to keep on editing it during the open phase of the competition? I hope this gets to your desk. My father, Norman Macrae, sends his regards. You may remember he covered the start up of Sun as a coming entrepreneurial success in The Economist when he was doing Silicon Valley storytelling early 1980s. He also completed his 40 years at The Economist with an Entrepreneurial Revolution 76-82-84 trilogy, still unequalled as a practical guide to the future’s entrepreneurial waves. The third part published in 5 languages in 1984 was the original “Death of Distance” future history, a genre now also known as world is flat. 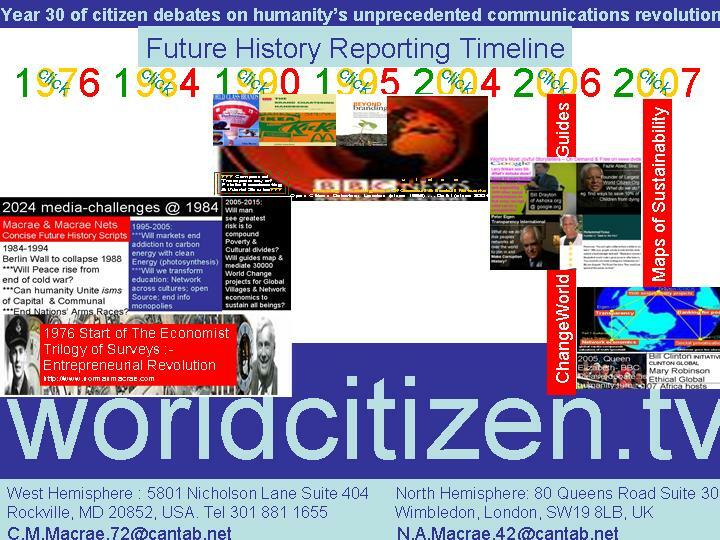 Our 1984 maps included the 7 most likely waves to sustain or end us all, as 1984-2024 emerged to be the first worldwide networking generation. Clean energy was supposed to have been the simplest wave to unite us! I am enclosing pre-release copy of the 23 annual brief of DoD networkers on where humanity’s exponentials of world change and sustainability have reached. Enjoy! I want to mention that there is a vital London junction on climate crisis map that needs interconnecting with CA. , NY, Nashville... Brief ABC map below; bit longer on backside of this letter. In surveys conducted by Entrepreneurial Revolution journalists, Gandhi ranks as most hi-trust human being. Which other socila networks value GandhI as The Greatest Leader the World has so far Enjoyed? Before listing some of them, here's a family story. My grandfather on my mother's side was trained at the Bar of London about a decade after Gandhi, as one of the medical and judiciary families networked into the British raj was by 1930 chief judge for the region of India that Gandhi organised his peace marches in, by the 1940s was a primary constitutional adviser to Britain's foreign office mediating what became India's Declaration of Independence. So yes I have a multicultural and mathematcial bias in suggesting we benchmark how to value hi-trust leaders everywhere against Gandhi, but equally love to hear your nominations and make a register of worldwide leaders inspired by the golden rule of relationship reciprocity - which I remember as always do unto others what you would wish others did unto your children. We are conducting an experiment amongst the poorest of the children in India . I do not know how far the experiment will go. We have the problem of giving real vital education to these children of India 's hovels, and we have no material means. We have to fall back upon the voluntary assistance of teachers, but when I look for teachers, they are very few, especially, teachers of the type wanted, in order to draw the best from the children through understanding, through studying their individuality and then putting the child on its own resources, as it were, on its own honor. And believe me from my experience of hundreds, I was going to say thousands, of children I know that they have perhaps a finer sense of honor than you and I have. The greatest lessons in life if we would but stoop and humble ourselves, we would learn not from grown-up learned men, but from the so-called ignorant children. Jesus never uttered a loftier or a grander truth than when he said that wisdom cometh out of the mouths of babes. I believe it; I have noticed it in my own experience that, if we would approach babes in humility and in innocence, we would learn wisdom from them. I must not take up your time. I have simply given you what is, at the present moment, agitating me, namely, the delicate problem, considered in human terms, of drawing out the best from these millions of children of whom I have told you. But I have learned this one lesson - that what is impossible with man is child's play with God and, if we have faith in that Divinity which presides over the destiny of the meanest of His creation, I have no doubt that all things are possible and in that final hope I live and pass my time and endeavor to obey His will. Therefore, I repeat that even as you, out of your love for children, are endeavoring to teach those children, through your numerous institutions, the best that can be brought out of them, even so I hope that it will be possible not only for the children of the wealthy and the well-to-do, but for the children of paupers to receive training of this nature. You have very truly remarked that if we are to reach real peace in this world and if we are to carry on a real war against war, we shall have to begin with children and if they will grow up in their natural innocence, we won't have the struggle, we won't have to pass fruitless idle resolutions, but we shall go from love to love and peace to peace, until at last all the corners of the world are covered with that peace and love for which, consciously or unconsciously, the whole world is hungering. Gandhiji greeting her, said, “We are members of the same family”. “I bring you the greetings of children,” said Madame Montessori. GANDHIJI: If you have children I have children too. Friends in India ask me to imitate you. I say to them, no, I should not imitate you but should assimilate you and the fundamental truth underlying your method. MADAME MONTESSORI: As I am asking my own children to assimilate the heart of Gandhiji. I know that feeling for me over there in your part of the world is deeper than here. 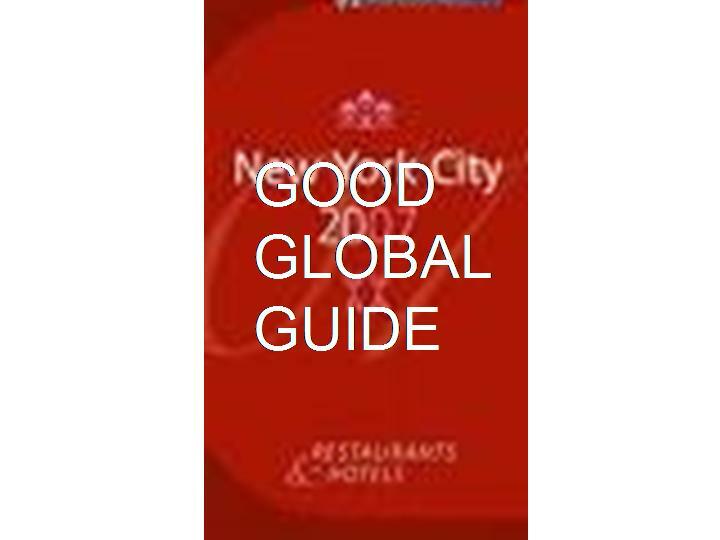 The WCBN is committed to the idea of supporting hi-trust world change travel guides in every format and around any crisis that human beings vote for needed international cooperation. Such support is propagated by ensuring that the coordinators of any change world solutions proposed by the WCN complete a survey that can be openly published anywhere on what help that project needs to repliacte its solutions appropraietly worldwide and how everyone can participate in that solution. 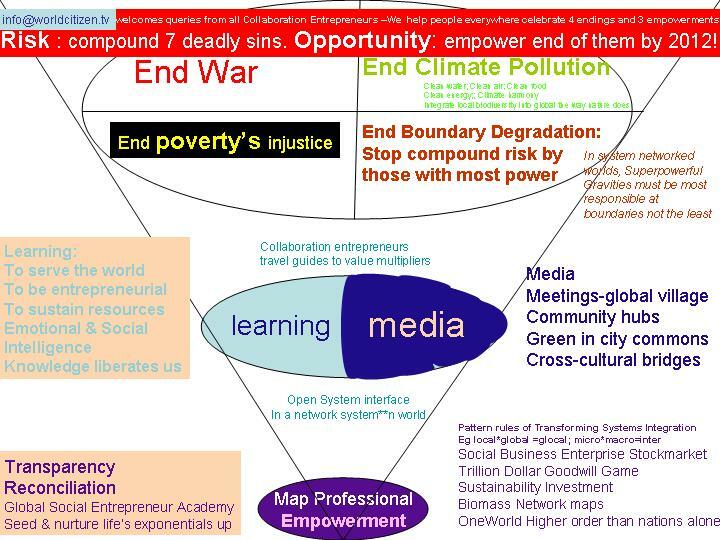 Moreover, the coordinator is delighted to learn with any other solution coordinators on the same change world map, wherever these are openly verified to be part of the overall solution human sustainability needs. Mail us at info@worldcitizen.tv if your WCBN has a story that needs to be integrated openly into the permanent stories bank of chnage world travel guides. Below are a few emerging stopries we are currently helping co-edit. Questions are also most welcome. examples: design a building at the same price as any other building but using 10% of 20th century power costs for heating/colling building; design a building that collects all its energy and water needs; all designs are local climate edited but the good news is that usually photosynthesis architectures are most efficient in extreme climate places where historically the climate has compounded poverty; we can also use deserts to farm algae to make any nation with a desert self-sufficient on all the gas it needs for autos and with a petrol that cleans the atmosphere of carbon as it is consumed. Sunlight is the fuel which sustains life on earth. The process by which plants extract energy from sunlight, using that energy to build up complex compounds from simper ones and thereby storing the energy which animals, including humans, use to grow and move and see and think is the life-process itself. We (human beings) have always exploited that life-process, but in the past we have only been able to do so by using living plants as our agents. We learned to cultivate them, develop them by selective breeding, and since the 1980s to meddle with their genes, but we have not yet learned to substitute something of our own making for the living plant. We have not found or made a more efficient substitute for chlorophyll itself outside the naturally-occurring factory which is the living cell. Until we design our own systems which can deploy the energy of sunlight as efficiently as humble algae does, we humans have no real biotechnology of our own. We have many kinds of solar cells which can extract energy from the sunlight and store is as electricity or heat, but such devices are very crude indeed beside the technical sophistication and versatility of living plants. Madame, you have overwhelmed me with your words. It is perfectly true, I must admit it in all humility, that however indifferently it may be, I endeavor to represent love in every fiber of my being. I am impatient to realize the presence of my Maker, Who to me embodies Truth, and in the early part of my career I discovered that if I was to realize Truth I must obey, even at the cost of my life, the law of love. And having been blessed with children, I discovered that the law of Love could be best understood and learned through little children. Were it not for us, their ignorant poor parents, our children would be perfectly innocent. I believe implicitly that the child is not born mischievous in the bad sense of the term. If parents would behave themselves whilst the child is growing, before it is born and after, it is a well-known fact that the child would instinctively obey the law of Truth and the law of Love. And when I understood this lesson in the early part of my life, I began a gradual but distinct change in life. I do not propose to describe to you the several phases through which this stormy life of mine has passed, but I can only, in truth and in perfect humility, bear witness to the fact that to the extent that I have represented Love in my life, in thought, word and deed I have realized the “peace that passeth understanding”. I have baffled many of my friends when they have noticed in me peace that they have envied, and they have asked me for the cause of that priceless possession. I have not been able to explain the cause by saying that, if my friends found that peace in me, it was due to my attempt to obey this, the greatest law of our being. It was in 1915 when I reached India , that I first became acquainted with your activities. It was in a place called Amreli that I found that there was a little school being conducted after the Montessori system. Your name had preceded that first acquaintance. I found no difficulty in finding out at once that this school was not carrying out the spirit of your teaching; the letter was there, but whilst there was an honest - more or less honest - effort being made, I saw too that there was a great deal of tinsel about it. I came in touch, then, with more such schools, and the more I came in touch, the more I began to understand that the foundation was good and splendid, if the children could be taught through the laws of nature - nature, consistent with human dignity, not nature that governs the beast. I felt instinctively from the way in which the children were being taught that, whilst they were being indifferently taught, the original teaching was conceived in obedience to this fundamental law. Since then, I have had the pleasure of coming across several of your pupils, one of whom had even made a pilgrimage to Italy and had received your personal blessings. I was looking forward to meeting the children here and you all and it was a great pleasure to me to see these children. I had taken care to learn something about these little children. I had a foretaste of what I saw here, in Birmingham , where there is a school between which and this there is a difference. But I also saw that there also human nature was struggling to express itself. I see the same thing here and it was a matter of inexpressible joy to me that from their childhood the children were brought to understand the virtue of silence, and how, in response to the whisper from their teacher, the children came forward one after another in that pin-drop silence. It gave great joy to see all those beautiful rhythmic movements and, as I was watching those movements of the children, my whole heart went out to the millions of the children of the semi-starved villages of India, and I asked myself as my heart went out to those children, “Is it possible for me to give them those lessons and the training that are being given under your system, to those children”?